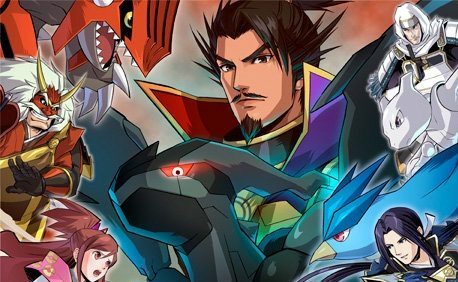 Nintendo of America have shared new information regarding Pokémon Conquest, announced last month to release on June 18th. Developed by Tecmo Koei, the Nintendo DS title sees players set out to prevent a powerful warlord, Nobunaga, from taking over the Ransei region. You must conquer each of the seventeen kingdoms to strengthen and grow their own, doing so leading to the awakening of a Legendary Pokémon that will save the land from destruction. You assume the role of a young warlord who shares a special bond with a Pokémon, with whom you must venture to recruit warrior allies who will aid your kingdom. After you have conquered a kingdom you will gain access to its facilities, including training grounds, shops and mines. a kingdom is conquered, players will also have access to the kingdom facilities such as training grounds, shops to buy items and mines for money. Players can strengthen their army by linking with new Pokémon, switching between them before battle to strategically counter the type that they will engage. Each warlord also has their own special ability that can change the tide of battle, warlord Oichi, for instance, has the ability to heal all the Pokémon in a player’s army. Pokémon Conquest will launch across North America on June 18th.